A major problem advertisers face in general nowadays is the fact that internet users are becoming more aware what an advert looks like and from the way AdWords and Adsense has hardly changed the way adverts look, people are becoming more aware of their presence. This ultimately causes people to just glance over the advert and not read it. Therefore, advertisers are getting impressions but no clicks. To compensate this, advertisers are constantly trying to find ways to increase their CTR. Without knowing, they have missed out the biggest way to increase it: don’t make their advert look like an advert. 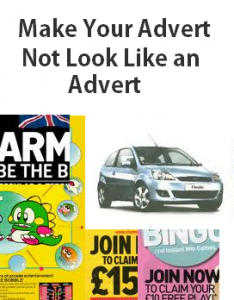 From this, here are some ways you can make an advert in PPC not look like an advert. Text adverts are extremely difficult to make them look not like an advert because you are not in control of their appearance. Instead, publishers that use Adwords will control how they look, what font, colour and size they are. However, there are ways you can increase your CTR with text adverts. All you have to do is create the perfect text advert. Include a call to action and words which aim to evoke an action from the reader being a click. Image and rich media adverts are much easier to make them not look like an advert because for them, there is no stereotypical look. For example, with text adverts, there is a header, description which is usually two lines and a URL at the bottom. With image.rich media adverts, what is the structure of it? There is no structure which makes it easy to change the look of it so it doesn’t look like an advert. To your surprise, the top advert gaining a CTR of 0.049% while the badly designed advert gained a higher CTR of 0.137%! This makes clear that no matter what idea you have, test it because it may produce better results! The bottom advert doesn’t look like an advert as much as the top advert. I think this is because nobody would believe someone would make an advert that bad looking and actually use it in PPC. The fact is that people do and it works! One last way you can make all your adverts not look like an advert is through not making your overall objective for your advert as a click. 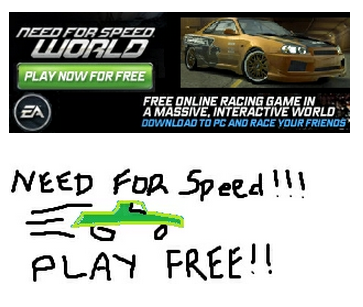 By this, I mean that don’t make clear that you want a click on your advert. Instead, you can provide information for the reader which doesn’t require a click. In doing this, you will help associate your advert away from being an advert. The slight confusion this causes will provide an incentive for the reader to click on your advert.